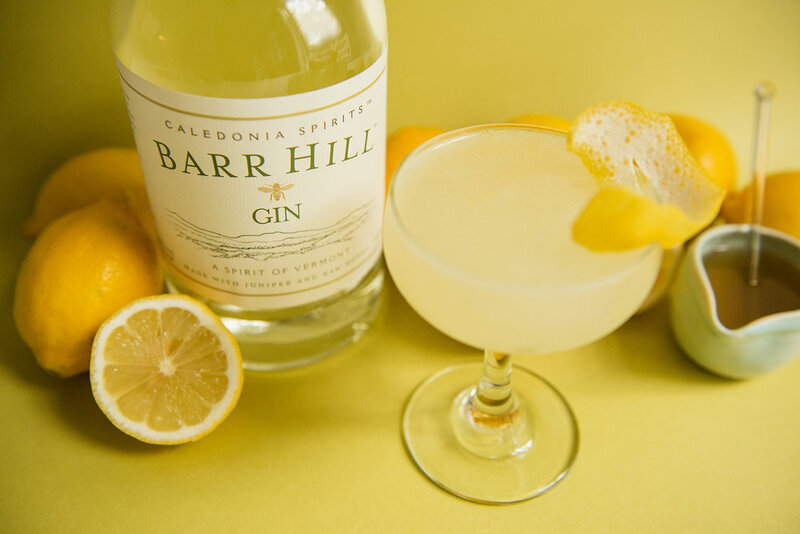 My friends over at Caledonia Spirits and Liquor.com are pairing up this week for Bee's Knees Week to raise money to save the bees and simultaneously bring awareness to the Bee's Knees cocktail. I remember my first Bee's Knees — at the East Village bar Niagara back in maybe 2001. They had no honey, and we had to run to the bodega to fetch some for them (OMG were we those customers!?). Shake ingredients with ice, strain, and serve up in a coupe glass. Garnish with lemon twist. I'm making the most of the summer over here. Gearing up for a family vacation to the shore before the kiddo starts school again, and enjoying the very weird Brooklyn summer weather — none of the high temps and humidity we're used to in NYC. It IS plenty hot enough, however, for a frozen cocktail, and I'm so stoked about this one. It's a pretty straight margarita recipe except I omitted the Cointreau or Triple Sec. You can add it in if you like it and have it around. I also added some ginger tea, because I love the combo of watermelon and ginger together, but you could absolutely omit it. The most important part is using frozen watermelon in lieu of any ice. It keeps the drink really juicy and flavorful and the texture is nice and thick from the fruit. 1 oz ginger tea (recipe below). To make ginger tea, cut a 3 inch piece of ginger into 1/8" slices. Boil in 1 cup of water for 10 minutes. Let cool and strain. Cube watermelon, and put in the freezer overnight. Combine all ingredients in a blender. Blend, and serve with a watermelon and lime garnish. You can spoon into the glasses or if you want to get a little fancy, put the mixture in a ziplock, cut off a corner, and pipe it in! Tonight, we're hosting our Ladies' Negroni Party at Krupa Grocery in Brooklyn in honor of Negroni Week where bars around the world serve Negronis to raise money for charity. I'm so pleased to be raising money for City Harvest this year, an organization whose mission is to redirect unused food from NYC's restaurants, supermarkets, etc. to feed our city's hungry. We've been selling Negroni pins and decanters. and our event will raise $ as well. The cause is our #1 priority, but I'm also a bit of a Negroni fanatic, so we'll be serving 2 of the most classic Negroni variations: a classic Negroni and a Negroni Sbagliato. Here are the recipes. Happy drinking, friends, and thanks in advance to all of you who are coming out to support the cause! Stir ingredients with ice in a mixing glass. Strain, and serve on the rocks with a long orange twist. Combine Campari and vermouth in a glass with ice. Add Prosecco and stir to combine. Garnish with an orange twist. After shipping 5 bazillion holiday orders, you could pretty much give me any kind of booze, and I'd be happy. Shot of Jägermeister? Okay, maybe not anything. But my cocktail mixing has been limited mostly to stirring a whiskey soda with my finger for the past month. But Christmas is almost here, 99.9% of the orders are out the door, and I'm going to drink a pretty, delicious cocktail thankyouverymuch. So I made a cranberry ginger syrup that's tart and syrupy and a great match for the bourbon and orange in this cocktail but equally delicious mixed with some seltzer for a non-alcoholic option. But here, I've used whiskey, because that's what I need to get into the holiday spirit. Combine ingredients in a shaker with ice. Shake, strain, and serve up. Combine all ingredients in a saucepan and bring to a boil. Reduce heat and simmer for 10 minutes or so until cranberries pop and mixture just barely starts to thicken. Strain. Use syrup for cocktail, and you can use the cranberry mixture as you would cranberry sauce.